Credit for the image belongs to the sourced GamesTalk article below. 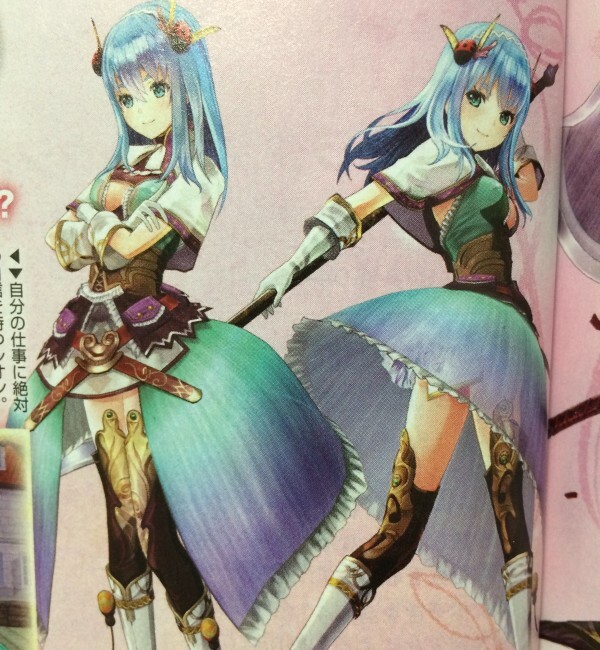 Atelier Sophie could be the start of a new Atelier subseries, if the Arland and Dusk worlds are any indication. If this turns out to be the case, we should pay attention to the new characters introduced as they might end up recurring (Sterkenburg, Linca, Wilbell.) And the new “Chase Link System” may be a recurring feature depending on the fan reception to it. Two new party members were recently introduced. First is Leone (shown above,) a tailor in her mid-20’s who uses spears in battle. She has an awkward personality and has trouble expressing her feelings: generally a proud person but means no ill will. She can use “jamming items” in battle. The other playable character is Fritz Weissberg, formerly a mercenary who has now developed a fascination with puppets (the only subject that can break his stoic exterior) and now makes a living performing puppet shows. He dual wields swords, and apparently the benefits from his item use are comparatively weaker than other characters, with no special item types or benefits to make use of. Another character revealed is Julio Sebald Leischencraft, a young knight from a neighboring country. He is soft spoken and articulate, and has developed an interest in studying alchemy for unknown personal reasons. There are no indications of his battle traits so far – it’s probably better to assume that Julio is not a playable character unless additional information comes out later suggesting otherwise. So far, it seems there are seven playable characters: Sophie, Monica, Oscar, Harol, Corneria, Leone, and Fritz. One major feature introduced to battles in Atelier Sophie is the “Chase Link System.” As it stands, it’s unique that all characters can use items in this game, and the Stance command is a new feature (not to mention the use of four party members in-battle!) In a battle, there is now a bar that fills as the player uses items or inflicts damage on an enemy, and decreases as party members take damage. At marked levels special skills can be triggered when party members’ stances are matched. If two characters are both in offensive stances when the Chase Link gauge is partially full, players can take advantage of a powerful dual-character support attack, while two defensive stances will allow the two characters to recover HP on activation and take reduced damage for a period of time. When the Chase Link gauge is completely full and all characters’ stances are matched, even stronger options are available. Completely matched offensive stances allow for an even stronger cinematic support attack, and matched defensive stances will allow for an area-of-effect HP restoration field for allies.